Michael McKillop clinched his second gold medal of the London Paralympic Games by winning the T37 1500m final for Ireland on Monday evening. The Glengormley athlete, who won over 800m on Saturday, streaked clear of the field at the halfway stage. McKillop was so far ahead of runner-up Brad Scott of Australia, he had time to wave to the crowd before the finish. The 22-year-old's winning time of four minutes, 8.11 seconds was a record for the Paralympic Games. The emphatic victory sealed McKillop's status as the world's greatest Paralympic middle-distance runner. A night of high emotion for the Northern Irishman was completed by him being presented with his gold medal by his proud mother Catherine. McKillop, who had not been told of his mother Catherine's involvement prior to the ceremony, had tears in his eyes as the medal was placed around his neck. Flowers were given to the gold medal winner by Paralympics great Baroness Tanni Grey-Thompson. The athlete, who is coached by his father Paddy, won his first paralympic gold at the 2008 Games in Beijing. "It was a big surprise. I didn't have a clue about it," said McKillop. "It's a great honour to have your mum there - I don't think it's ever happened before. "When she walked out into the stadium, I said to Brad Scott, who came second: 'That's my mum'. "She congratulated me and said she loved me." Mrs McKillop, 48, said: "I was just so honoured - what a privilege to be given. "Words can't describe it. I'm so proud of Michael. It's a memory that will stick with me forever - and an emotional memory at that." McKillop, who has cerebral palsy, had a season's best coming into the race more than 20 seconds faster than the next quickest in the field and it proved as comprehensive on the track as it looked on paper. Content to sit behind Scott early on, he passed him before stretching clear from way out, already acknowledging the applause of the crowd as he came off the final bend to win by more than six seconds. 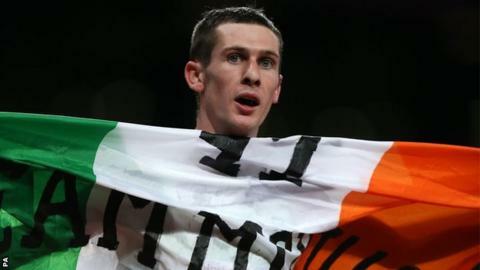 It took Ireland's gold medal total in the Olympic Stadium to three, sprinter Jason Smyth having started the ball rolling.